These spectacular Teaching DVDs (really, they are) utilize tutorials, diagrams, and on-the-water footage to educate the casual fisherman about the newest (and oldest) techniques of catching crappie in any condition. 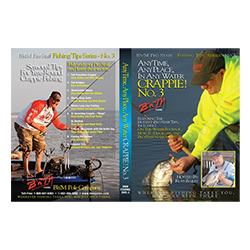 Covering many different techniques, these DVDs are professionally produced and edited by Russ Bailey, host of the popular Midwest Crappie TV show - the only show dedicated to crappie fishing. Each segment includes diagrams, how to, and (3) tips for each technique, and each segment is conducted with a different pro staffer from B’n’M. They cover a wide variety of products and manufacturers, not just B’n’M. From vertical jigging to pulling summertime crankbaits, these DVDs help YOU catch more! This year’s new introduction “No.3” adds even more to your “crappie-cation” with exclusive techniques for fishing bridges to brush, winter thru summer, and everything in between.